Inside Metal's "Rise of L.A. Thrash Metal" DVD (Part One) to Hit Stores on January 19, 2018 - Welcome To All That Shreds Magazine! Throughout history, the San Francisco Bay Area has long been deemed as the epicenter for thrash metal, whereas Los Angeles has invariably been considered the stomping ground for glam and hair metal. True, San Francisco has birthed many exceptional thrash bands since the early ’80s, but the fact remains – Los Angeles is the rightful birthplace of three of the “Big 4” thrash bands and is the breeding grounds for unconventional thrash/punk-metal bands. From legendary thrash icons Metallica, Slayer, and Megadeth, to punk/metal renegades Suicidal Tendencies and combative thrash stalwarts Dark Angel and Hirax, they all generated from this pretentious, megalopolis hellhole we call Los Angeles. 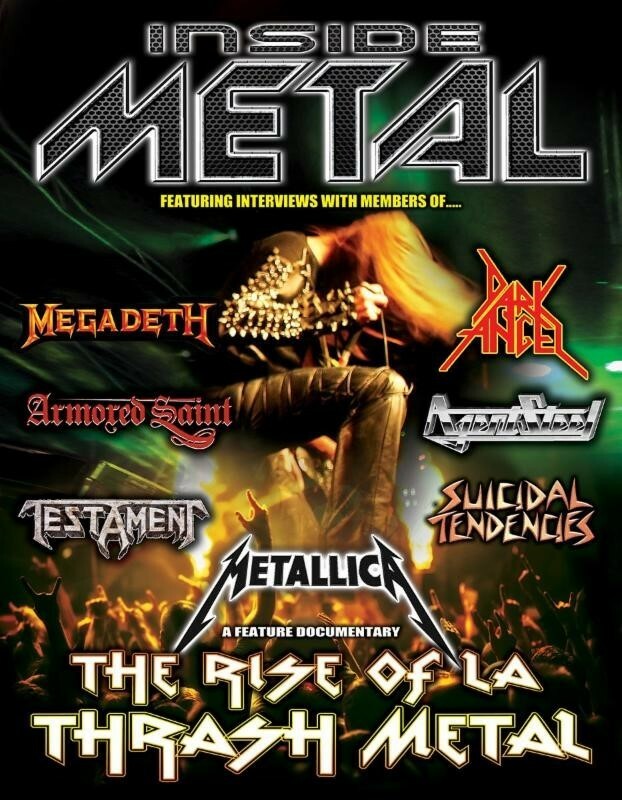 MetalRock Films is thrilled to release a new two-part Inside Metal documentary DVD series exploring this topic, entitled The Rise of L.A. Thrash Metal. The first DVD in the two-part set is set for release on January 19, 2018. Directed by Bob Nalbandian with narration by David Ellefson of thrash legends Megadeth, the documentary focuses on the Los Angeles thrash metal uprising of the early/ the mid-’80s and acts as a follow-up to the first two Inside Metal titles, The Pioneers of LA Hard Rock & Metal and LA Metal Scene Explodes. As followers of the Inside Metal series know, each documentary includes exclusive, in-depth content and interviews with heavy metal icons and those who helped build the scene. Those featured on the DVD include (alphabetically): Ann Boleyn (Hellion/New Renaissance Records), Bill Metoyer (Producer), Brian O’Brian (A La Carte), Brian Slagel (Metal Blade Records), Brian Tatler (Diamond Head), Chris Poland (Megadeth/OHM), Craig Locicero (Forbidden), Dave Lombardo (Slayer/Suicidal Tendencies), David Ellefson (Megadeth), Diego Negrete (MX Machine), Eric Peterson (Testament), Ernie C (Body Count), Felice Lococo & Kurt Markham (Overkill LA), Frank Bello (Anthrax), Gene Hoglan (Dark Angel/Testament), Greg Durschlag (The Weasels), Jay Reynolds (Malice), Joey Vera (Armored Saint), John Bush (Armored Saint/Anthrax), John Gallagher (Raven), Juan Garcia (Agent Steel/Abattoir/Body Count), Katon DePena (Hirax), Kevin Estrada (Photographer), Lars Ulrich (Metallica), Lloyd Grant (Defcon), Malcolm Dome (Journalist), Marty Friedman (Hawaii/Cacophony/Megadeth), Mike Inez (Alice In Chains), Monte Pittman (Prong/Madonna), Peter Baltes & Wolf Hoffmann (Accept), Phil Sandoval (Armored Saint), Phyllis Pollack (Journalist), Rocky George (Suicidal Tendencies), Scott Peterson (Cryptic Slaughter), Steven Craig (former manager of Slayer & Dark Angel), Stryper (Robert Sweet, Michael Sweet, Oz Fox, Tim Gaines), Tracey “Spacey T” Singleton (Sound Barrier/Gangland), Tracy Barnes (Radio PD), Vincent Price (Steel Prophet/Body Count), and William Howell (KNAC Radio Host a.k.a. DJ Will, former A&R Capitol Records and Metal Blade Records). Each special guest on the DVD provides unique and first-hand insight into the birth and rise of one of heavy metal’s originating genres. This is a must-see DVD for anyone with a passion for heavy music, and makes a great gift. Pre-orders are available now via Amazon. Stay tuned for more buzz and exclusive clips coming soon leading up to the release of The Rise of LA Thrash Metal part one! Learn more about MetalRock Films and Inside Metal’s The Rise of LA Thrash Metal online via www.metalrockfilms.com.